There are really two parts to this project. 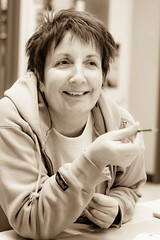 An exhibit of women’s art will be presented in the 3rd on 3rd Gallery, accompanied by workshops and salons, culminating with a celebration on March 31, 2012 of SWAN Day. We had committed to making this part happen regardless of whether we got the grant. 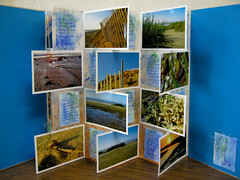 Prototype of the Photo Flag Book. Imagine twelve of these all hanging on a wall - filled with images of creative women. Because we are the proud and humble recipients of the Ray and Wyn Evans Artists in Community grant for 2012, part two will happen as well: the creation of a series of twelve photo flag books that celebrate the creative contributions of women. Who is “we”? We are Debra Eck and Jennifer Schlick and we have known each other for quite some time. We live on the same block and have kids who went through school together. We were co-leaders of various Girl Scout troops. We have hiked together, cooked together, sewed together, made art together. We joined forces to dream up and execute this crazy project. 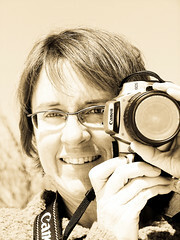 Jennifer Schlick: I started making photographs in 2004 with my first digital camera – a Kodak CX6445 Zoom. In 2006, I graduated to a digital SLR – the Canon Rebel XT, which I upgraded in 2011 to the T2i. My favorite subject will probably always be the natural world. I am particularly fond of making small things large. My most well-developed collection is a series of spring wildflowers of the northeast deciduous forest, some of which are the size of my pinkie fingernail. I enlarged them to 12X12 for a solo show at the Prendergast Library in spring of 2011.